How do societies stick together? How do you organise the cooperation of millions of people – a modern challenge that humans have only had to face since the emergence of civilisation in Asia a few thousand years ago? At the root of any successful project of that kind is a set of beliefs and values shared by a large number of the population – beliefs and values that bind them to the existing order. Modern capitalism, for example, is strongly rooted in individualism, consumerism, the idea of the free market as being fundamental to human life, and a social hierarchy based on wealth. Colonialism and imperialism add the obscure concept of ‘race’ to this social hierarchy. Feudalism, by contrast, has less emphasis on the freedom of the individual (the capitalist ‘entrepreneur’), and more emphasis on obedience to a king, lord, priest or other patriarch, whose absolute powers are implicitly bound up with those of a divine entity (this helps to explain, incidentally, the pervasiveness of strongly hierarchical religions in all feudal societies). Collective belief in the values and foundational stories of a given society is crucial for the survival of that society. This is why all societies go to great lengths to preserve these values and stories, to spread them via education and propaganda systems, and to present them as universal and correct. Modern capitalism, with its extraordinarily powerful media and sophisticated means of propaganda, heavily promotes its own beliefs and values, and we are exposed to these from the cradle to the grave. What are the beliefs and values of a socialist society? The Soviet Union explicitly organised itself in accordance with a Marxist-Leninist ideology. Marxism is associated with values such as equality, universal prosperity, internationalism, elimination of exploitation and oppression, ending war, and empowering those layers of society that are most oppressed under capitalism (in particular the working class). Leninism extends these values and ideas of Marxism and applies them to the period of modern imperialism, to the period of actual socialist revolution, and obviously to the then-prevailing revolutionary situation in Russia. Lenin being Russian, Marxism-Leninism enjoyed an additional legitimacy among the Russians on account of its ‘homegrown’ nature. The early generations of Soviet people had a strong feeling that they were the vanguard of world revolution, of a bright new future. As they achieved the fastest industrialisation in history, along with vastly improved living standards for the masses, and of course the historic victory over fascism in the Second World War, the superiority of socialism was assured. The spread of socialism to Europe, Asia and Cuba in the 1940s and 50s also fed into this feeling, as did the rise of the national liberation movements across Africa. The immediate post-war years – with fascism defeated thanks to the heroism of the Soviet people, with the Cold War yet to make its full impact, and with a national leader (Stalin) who was very widely respected – probably constitute the zenith of Soviet pride and national spirit. Through the 1960s, 70s and 80s, however, more and more people lost their commitment to the official ruling ideology; society’s foundational stories were starting to lose their pull. By the time the Communist Party leadership itself started (under Gorbachev) to challenge the basic beliefs underlying the system, the masses were by-and-large sufficiently alienated from these beliefs that they were ambivalent in the face of this cyclopean act of social sabotage. After a lengthy and complicated power struggle between Nikita Khrushchev and Georgy Malenkov following Stalin’s death (in March 1953), Khrushchev had managed to consolidate power towards the end of 1955. One of his first priorities was to attack Stalin’s legacy in relation to excessive political repression, abuse of power, mass deportations, and the cult of the personality. His ‘secret speech’1 at the 20th Congress of the CPSU in February 1956 is a watershed moment in Soviet history. According to Khrushchev and his allies, the speech was not intended to entirely negate Stalin (the speech starts by noting that “the role of Stalin in the preparation and execution of the Socialist Revolution, in the Civil War, and in the fight for the construction of socialism in our country, is universally known” and ends by admitting that “Stalin undoubtedly performed great services to the Party, to the working class and to the international workers’ movement.”); rather, its professed purpose was to expose Stalin’s errors and excesses with a view to improving and modernising the Soviet political system – doing away with personality cults and establishing a coherent system of socialist revolutionary legality. To what extent some level of ‘destalinisation’ was needed at that time remains a controversial and difficult topic on the left. The fact that the CPSU leadership largely went along with Khrushchev’s line indicates that there was a fairly widespread feeling that the repression under Stalin had been excessive and that there was a need to create a more relaxed political environment. The Soviet working class, having seized power, found itself having to contend with a ruthless and well-connected former elite; a peasant majority that was a long way from being a stable ally; and an intelligentsia that was largely suspicious and disparaging of the upstart Bolsheviks. Lenin and his comrades had been convinced that the Russian Revolution would help to spark a series of socialist revolutions throughout the continent, thereby replacing powerful European enemies with powerful European allies. This European revolution failed to materialise; instead of the European working class coming to the aid of its Soviet brothers and sisters, the European ruling classes came to the aid of the White Army of deposed capitalists and landowners in order to destroy the Soviet project. The Soviet state was forced to withstand a bloody civil war, followed by an extensive programme of espionage and destabilisation conducted by the western powers and Japan throughout the 1920s and 30s; and finally the genocidal war and horrific devastation wrought by the Nazis. Clearly, the USSR wouldn’t have survived without repression, and it’s not particularly difficult to understand how this repression could have got out of control. In the changed political context of the postwar years, there was a good case for doing away with personality cults, widening popular democracy, increasing freedom for public debate, and building new norms of socialist legality. At the subjective level, changes were obviously needed in order to restore revolutionary optimism; there was a sense of wanting an easier life, of needing to rebuild the country and develop a modern, prosperous socialism. Plus Soviet society was by now in its second or third generation, forty years removed from the uprising of the St Petersburg metalworkers. Notwithstanding the horrible trauma they had experienced during the war, the average soldier returning from the battlefields of Europe had grown up in a society that valued equality, community, education, progress and peace; this Soviet citizen had been to school, was literate, knowledgeable and cultured. His or her expectations must have been fundamentally different to the expectations of the first generation of Soviet revolutionaries. External circumstances also seemed to support a loosening of the political system. The USSR was no longer isolated: the socialist camp had expanded to include a large part of Asia and Europe, and important countries such as India and Indonesia had broken free from the grip of European colonialism and were being transformed into independent powers, more-or-less friendly towards the Soviet Union. The country’s vast borders were less vulnerable now that they were now largely shared with friendly states: China, Mongolia, DPR Korea, Poland, Romania, Czechoslovakia and Afghanistan. Meanwhile the arrival of the era of nuclear weapons meant that both the USSR and USA had more to lose from outright war between the two superpowers; peaceful coexistence became plausible, indeed necessary. Nearly four decades later, Mao’s portrait still occupies pride of place on Tiananmen Gate. Anticommunist historian Orlando Figes opines that the speech “changed everything. It was the moment when the Party lost authority, unity and self-belief. It was the beginning of the end. The Soviet system never really recovered from the crisis of confidence created by the speech”.13 This is an exaggeration, but it contains a kernel of truth. Khrushchev’s clumsy and inept ‘destalinisation’ had a profoundly damaging effect and would be more accurately called ‘delegitimisation’, not only of Stalin but of the whole record of Soviet socialism. The post-Khrushchev leadership of Brezhnev and his team rolled back the attack on Stalin’s legacy to some degree, settling on a more balanced assessment that emphasised Stalin’s historic role in guiding the construction of Soviet socialism and leading the war effort, whilst decrying abuses of power. However, the first steps towards undermining Soviet ideology had been taken, and these laid the ground for the generation of right-wing and liberal intellectuals who, in the Gorbachev era, made their way to the heart of government and led the dismantling of socialism. In reality, significant cracks had been observable in the world communist movement for quite some time. Failing to understand the strategic necessity of the non-aggression pact signed between Germany and the Soviet Union in August 1939 – incorrectly perceiving it as a capitulation to fascism, rather than an unavoidable act of self-defence forced on the USSR by western Europe’s accommodation of Hitler and its desire to push Germany into attacking the USSR – communist parties in Europe and the Americas suffered deep divisions and waves of resignations. Many longstanding communists who had fought against fascism in the streets of London or Paris – or in the Jarama valley – felt confused and betrayed, and the local communist leaderships struggled to promote solidarity with the Soviet Union whilst simultaneously maintaining the fight against fascism on the ground. Further confusion, disunity and disillusion was created when the Soviet leadership advised the French and Italian communist parties not to attempt armed revolutionary uprisings in the late 1940s. This advice was given on the basis of level-headed strategic reasoning about the relative balance of forces in Europe (most importantly the permeation of US troops in Western Europe and the inability of the Soviet Union to provide direct military support to those countries); however, it generated resentment and divisions that would grow and spawn further problems in the decades to come. In the early postwar period, serious disagreements emerged between the Yugoslav and Soviet communist parties over a number of issues: the establishment of a stable peace in Europe, the possibilities for supporting the communist side in the Greek Civil War, and the economic mechanisms of building socialism in Eastern Europe. Whichever side was right or wrong in the initial disagreements, the Soviet leadership responded to Yugoslavia’s assertion of independence in a heavy-handed way that this served to inspire distrust of the USSR. Yugoslavia was by no means an insignificant country, and Tito and the Yugoslav Communist Party had earned enormous respect around the world for their heroic defence against Nazi occupation. Tito had been known to many European communists and anti-fascists before World War II, when he managed the Paris centre recruiting anti-fascist volunteers to fight in the Spanish Civil War. The Yugoslavs’ sudden expulsion from the Information Bureau of the Communist and Workers’ Parties (which had been established in 1947 in order to coordinate actions between communist parties, and which ironically had its headquarters in Belgrade) and the severe measures taken against it shocked many people in the west European parties. The unity of the world communist movement was even more profoundly shaken by the Sino-Soviet split, which started to quietly emerge in 1957 and which by the early 1960s became a full-scale ideological conflict. Initially, Mao Zedong and his comrades had cautiously welcomed Khrushchev’s policies of destalinisation and peaceful coexistence; but from 1957, driven in part by a resentment of Soviet hegemonism and in part by their own turn towards a more radical domestic agenda (particularly the Great Leap Forward, which represented a major break with the economic programme proposed by the Soviets), they started to voice their opposition to these policies. The Soviets once again over-reacted to the questioning of their authority over the global communist movement, and punished China by unilaterally withdrawing their (thousands of) advisers and by criticising Chinese ultra-leftism in international forums. The Chinese side took to increasingly bitter polemics against Soviet revisionism, and actively challenging the USSR’s leadership of the global communist movement. Increasingly, the Chinese Communist Party was able to point to lukewarm Soviet support to militant national liberation movements as proof that the USSR had given up on the fight against imperialism and that China was the natural leader of the global anti-imperialist struggle. This argument resonated in much of Asia, Africa and Latin America. The Sino-Soviet split also opened a path for the US to ‘triangulate’ in its war on the socialist camp, siding with one against the other in order to avoid facing a united socialist bloc. After taking power in 1964, the Brezhnev leadership significantly stepped up Soviet solidarity with national liberation movements and the post-colonial states of Africa, and Soviet prestige also benefited to some degree from the chaos that reigned in the Chinese Foreign Ministry in the late 1960s during the Cultural Revolution. However, the Soviet Union would never regain its place as the undisputed leader of the oppressed masses of the world. Jeremy Friedman writes that “revolutionary energies exploded in the developing world. The grievances that motivated these revolutionary outbreaks were often expressed in terms of identity — racial, ethnic, or national — more than class, while in the industrialised world the insurrectionary ferment of the now largely sated working class was replaced by the alienation of students and racial minorities.”19 The Soviet Union was less experienced in dealing with these movements than it was with the traditional organisations of the industrial working class, and Soviet socialism had a less obvious appeal for them. Whereas the Soviet Union in the 1920s and 1930s had been the apple in the eye of the global working class movement, by the late 1960s it was viewed in a negative light by many of the progressive elements outside the socialist camp – due to the various issues outlined above, and also to the extraordinary intensity of Cold War propaganda and McCarthyite repression from the late 1940s onwards. When hundreds of thousands came out into the streets of 1968 in Paris and elsewhere, they didn’t carry portraits of Brezhnev. The seemingly unstoppable tide of progressive opinion in the west away from Soviet-style socialism even prompted many of the CPSU’s closest allies in western Europe to distance themselves from Moscow, cultivating a variety of socialism they hoped would be more palatable to western tastes and which emphasised ideological independence from the Soviet Union. This theory, voiced with such certainty by Soviet economists and their global allies, must have seemed like an absolute truth in the 1930s, when the Soviet economy was growing at 5 per cent a year while in the US “output fell by 30 percent and unemployment increased eightfold, from 3 percent to 24 percent”.25 And yet the theory of the general crisis severely underestimated postwar capitalism’s ability to cheat death. The Soviet Union won World War II, but in so doing it sustained the most horrific human and economic losses. The US, meanwhile, had been able to attach itself to the winning side and turn a profit at the same time, in an early example of the military-industrial complex. Enormous investment in western Europe via the Marshall Plan provided lucrative avenues of investment for US capital, whilst establishing a solid anticommunist bloc to counter the huge prestige of the Soviet Union, and creating an economic bond that would force western Europe to unite behind US leadership. The establishment of the North Atlantic Treaty Organisation (Nato) added a military factor to this new-found imperialist unity, and the Bretton Woods system instituted an international monetary order that was controlled almost exclusively by the US. In short, the US was able to breathe new life into the capitalist system after World War II by using its economic dominance to reduce inter-imperialist rivalry, give a kick-start to economic globalisation, introduce some Keynesian reforms, prevent several countries from adopting socialism (via bribery, coups and/or military intervention), and unite efforts to isolate and destabilise the socialist camp. As a result, far from languishing in ‘general crisis’, western (and particularly US) capitalism entered something of a golden era, during which it was able to realise undeniable advances in science and technology, as well as raise living standards and create opportunities for large sections of the population. And yet closing the gap proved difficult. As discussed in the second article of this series31, the US had a number of advantages that enabled it to sustain steady growth throughout the 50s and 60s: unlike the Soviet Union, it was not devastated by war; unlike in the Soviet Union, wars and military expenditure constituted an economic boost rather than a drain; unlike the Soviet Union, it benefited immensely from the exploitation of people and resources in the developing world; and unlike the Soviet Union, it felt no particular obligation to privilege the basic needs of the masses over the exploration of new markets and technologies. Furthermore, the other countries in the capitalist camp were for the most part advanced industrialised economies, and their integration into a bloc provided an important impulse for scientific collaboration. Meanwhile, the countries newly incorporated into the socialist camp were the poorer and less-developed countries of Eastern and Central Europe, along with the barely (if at all) industrialised nations of East Asia. But once an expectation is set, the failure to meet it creates disappointment. The Soviet Union continued to grow at an impressive rate well into the 1970s, but so did the US and the major economies of western Europe and Japan; therefore the gap did not close. 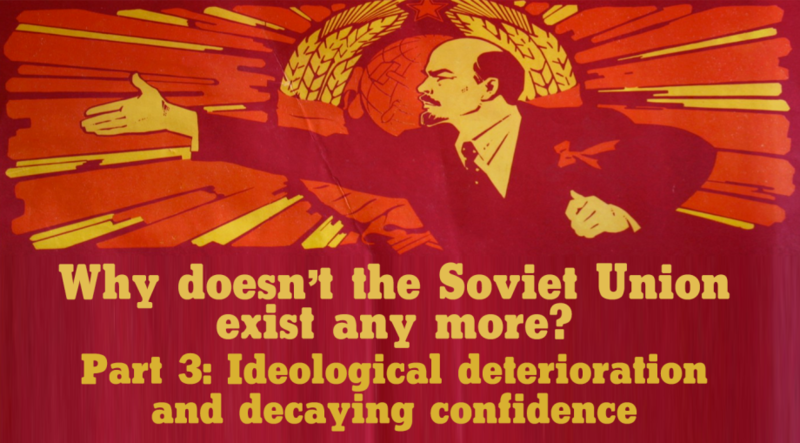 By the late 1970s, Soviet growth was grinding to a halt, just as the US and Western Europe were starting to experiment seriously with neoliberal economics – dialling up their attacks on the organised working class, privatising, globalising, deregulating, lowering wages, and leveraging technology to stimulate a redefined economy with the balance of power tipped even further in favour of the capitalist class. As it became increasingly clear that US-led western capitalism was not on the verge of collapse; as the CPSU started to lose its undisputed leadership role in the global movement for a better world; and as the Soviet economy started to show signs of old age, nihilism began to creep into the popular mindset. The official line found in the pages of the party’s newspapers and textbooks was that the plan remained on-track – that the Soviet economy was going from strength to strength and that imperialism was wheezing its way to a long-overdue death. This narrative simply didn’t ring true to a lot of people any more. Rather than presenting and attempting to understand/explain the changed global situation, the party increasingly found itself shouting slogans that were out of touch with reality. Keeran and Kenny observe that “in many respects ideology became complacent, formalised, and ritualistic. As a result, ideology repelled many of the best and brightest”.34 Some of the more astute theoreticians within the Soviet leadership – people such as Mikhail Suslov and Boris Ponomarev – worked to adapt Marxism-Leninism to the new circumstances of the 1960s and 1970s, indicating that the party at least acknowledged the growing problems of ideological stultification and popular alienation. Ultimately however these efforts didn’t have the desired results. The CPSU’s ideology was never able to recover the relevance, urgency, utility and currency that it enjoyed in the pre-war era. Khrushchev had also introduced a cultural ‘thaw’ which saw an increase in the number of foreign books, movies and records, and which allowed an unprecedented level of open criticism of the state by Soviet writers. This was most famously manifested in Khrushchev’s personal approval of the publication of One Day in the Life of Ivan Denisovich, a much-sensationalised account of life in Soviet prisons, written by the obsessively anti-communist tsarism-nostalgist Aleksandr Solzhenitsyn. Over half a century later, it’s difficult to judge the extent to which the ‘thaw’ was a mistake on Khrushchev’s part or a more-or-less inevitable response to the popular demand for a more open society at that time. As discussed earlier, the need to widen democracy and allow greater individual freedoms is a complex problem for socialist states under siege. In a world dominated by imperialism, a socialist leadership has to carefully balance responding to the legitimate demands and needs of the people with not creating structures that can easily be leveraged by hostile states to destabilise and to spread disinformation. Khrushchev probably got characteristically carried away with his own idea and went too far too soon. The Brezhnev leadership partially reversed the ‘thaw’, but by that point the critics of the system had established themselves as personalities, had built a following, and were in contact with one another; driven underground, the ‘thaw’ transformed into a dissident movement that would become a major cause célèbre in the west and served to further undermine the confidence and prestige of the Soviet people. Another problem faced by all socialist societies (at least, all those that survive longer than a single generation) is how to maintain revolutionary zeal through multiple generations. As discussed above, the average Soviet citizen of 1967 was a very different person to the average Soviet citizen of 1917; she had an entirely different experience of life and understanding of the world, along with different expectations, motivations and aspirations. She hadn’t been inspired directly by the steelworkers standing up defiantly against ruthless bosses or the humble peasants demanding land and peace. Her education told her that the struggle against capitalism and for socialism was important, but she hadn’t necessarily learnt it from life experience in the same way that her parents or grandparents had, so how can she be persuaded to fight like they did? This remains a tough problem for the socialist world to solve; after all, what revolution thus far can claim that its second or third generation has been able to match the revolutionary passion of its first generation? The Soviet leadership attempted to dodge this particular bullet by maintaining power largely in the hands of the earlier generation of revolutionaries and, particularly in the Brezhnev period, keeping people in top positions for longer rather than seeking to introduce younger people. “The average age of Politburo members rose from fifty-five in 1966 to sixty-eight in 1982.”37 One unintended result was the deepening ideological alienation of young people. Propaganda was tedious in content, monotonous in form, and disconnected from reality. The authorities concealed the truth by only reporting good news, which lost the people’s trust. The CPSU dealt with intellectual circles by administrative and repressive means. Real information had to come from abroad, but this only made Russians further disbelieve their own media. In a context of rising alienation, economic stagnation and ideological deterioration, it was easy enough for the seeds of counter-revolution to sprout. The next article will describe how the US attempted to take advantage of the USSR’s growing economic and ideological problems, ramping up military and political pressure with a view to winning a decisive victory in the Cold War.